Order as many COMPLIMENTARY copies as desired for patients, employees and colleagues as a service from Clint Pharmaceuticals. Additional Life Reference Manual titles are also available for family and friends. Provided as a fresh new Biblical resource, the new pocket-sized PHYSICIAN'S LIFE REFERENCE is free of charge to physicians and nurses in an effort to give you, your staff and your patients practical solutions to life's challenges. All active accounts with Clint Pharmaceuticals are welcome to have as many copies as needed for both your patients and staff. The front pages of this PLR contain an index that refers the reader to answers to the most frequently asked questions regarding one’s physical and spiritual well-being. Our desire is that this PLR offers hope and insight to all who read and apply it’s principles. 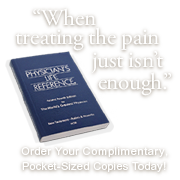 For your complimentary copy of the Physician's Life Reference, you can call us at 800-677-5022 or email us at info@clintpharmaceuticals.com or send us your information on our Contact Us page. For more information about the Life Refernce Manuals, please visit GoThereMinisteries' website.